Simply Baby is a collection of knitting patterns for the baby, age 0-2 years, in your life. I choose this book from a huge variety of baby knit books from the library because I find Debbie Bliss has a very modern eye for baby clothes. The patterns are incredibly simple to follow and they are adorable in every way. 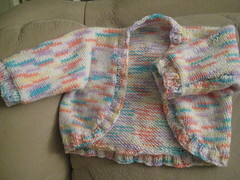 I made the baby shrug for my cousin, who is due early next year. Its knit in one piece and in plain stockinette stitch. I feel like this pattern is a good foundation for improvised designed. I can easily alter the number of stitches to accomodate for cables, eyelets and ribbing designs. I’ll be knitting a few other patterns from the book as well, including baby mittens and baby booties. This book is a great introduction to baby knits for a new knitter, or a knitter who has never knit babywear before.